Z-Lab Architects, based in Seoul, are known to create buildings suited perfectly to its environment, both physically and culturally. Today we will explore this ethic by taking a look at the innovative and natural Blind Whale House. This structure consists of two semi-detached buildings, built up of rough and raw stones. 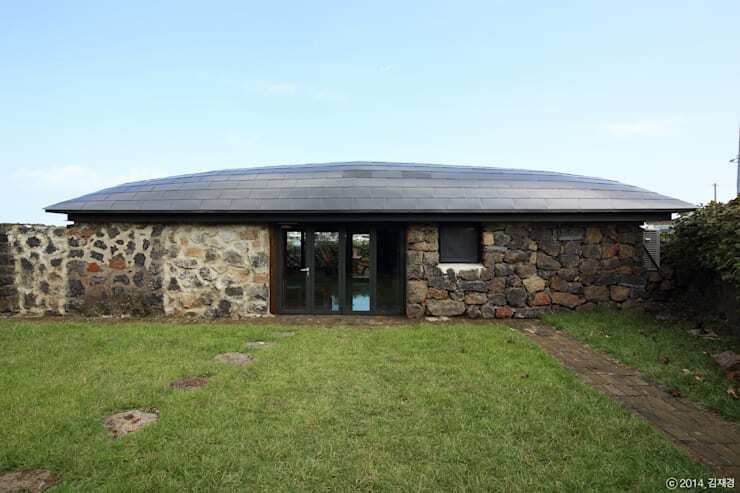 The name 'Blind Whale' comes from the home's structure, and especially the domed, tiled roofs resembling the backs of whale emerging from the water's surface. 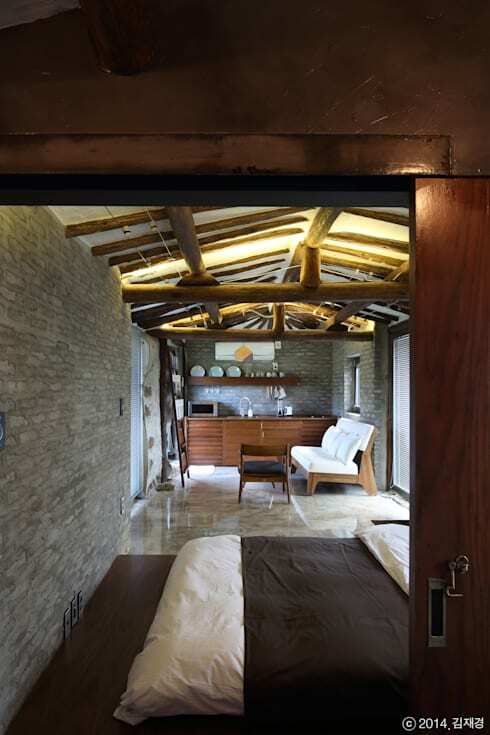 The traditional lifestyle and spirit of the Jocheon people indigenous to the area is captured in this rustic home, emphasising living in harmony with nature and in reverence of the ocean and its inhabitants. As we will see upon closer inspection of the the house and grounds, nature is indeed the main focus and key influence. From the stone and wooden structure to the furnishings and decoration, it all comes together to make you feel apart of nature itself. Sound exciting? We definitely think it is. So why not join us to take a closer look? The house, that was completed in 2014, was intended to evoke a sense of circular temporality know in the traditional stone houses of the area. This is achieved by the flattened oval shape of the house, and the domed-shaped roof. We can easily see why the structure is likened to the body of a whale, especially with the smooth yet scaly texture created by the roof tiles. 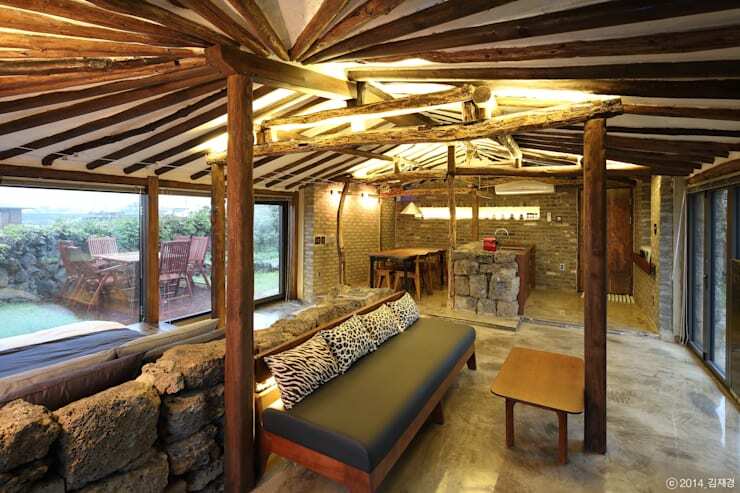 The house is a one-floor bungalow constructed of unrefined or raw stones. The stones are cemented by mortar, but this is more visible in some area than others, adding to the natural and raw character of the home. At this point the house may not look much more than a quaint little stone cabin somewhere in a remote village, but don't dismiss it yet, we're just getting started! If you're not bowled over by this image, we don't know what will do the trick. Isn't it spectacular? 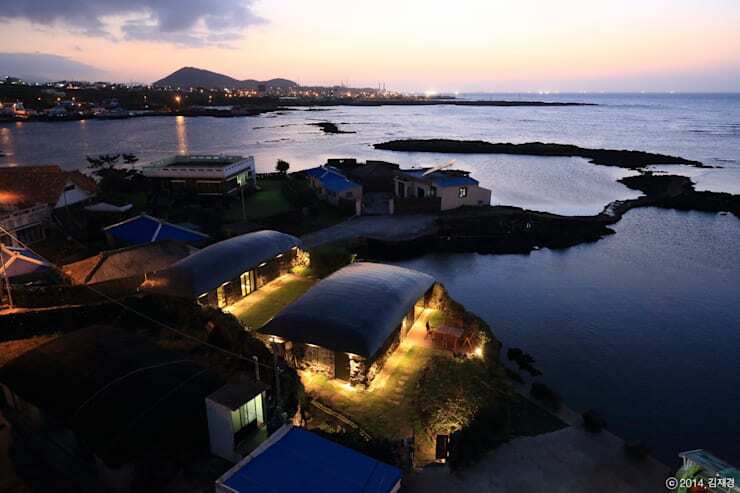 The Blind Whale House is situated on the edge of the bay, and here we can see how it not only has a lovely view of the ocean, but also of the peninsula itself. There is no doubt that the inhabitants of this house must have gorgeous panoramic views all of the time. From this areal vantage point, we can also see that the home consists of two similar structures interlinked by a stone pathway. The one being an individual flat, while the other provides a larger living quarters and entertainment area: the private and the public respectively.The external lighting of both structures is also magnificent, as lights the entire boundary of each building, making it seem like a glowing halo around them. So now that we've seen the exterior of the home up close and from a far, the time has come to take a look at the insides as well. We will start our journey off in the living quarters. Here we can see part of the living room, as well as the kitchenette at the back. The overall look is certainly rustic, aided by the natural elements used in both construction and decoration. The raw atmosphere of the space is warm and comforting, aimed at making the inhabitants feel at one with nature. The wooden beams used in the ceiling and for supports, as well as in the frames of the glass doors is the most prominent feature and provides that timeless natural aesthetic. The inner walls consist of brick to give more sturdiness and safety, while the same rough stones used in the exterior is used here to create division and as a decorative feature. The colour scheme is suitably neutral and the furnishings are minimal. If you think that up to this point your ideas that the house is fairly primitive have been proven right, then you're in for a treat when we get to the individual flat. The same basic interior architecture is present here that we saw in the previous area, such as the brick walls and the wooden-beamed ceiling, but it's how the room is furnished and decorated that makes all the difference. At the far back we can see a kitchenette with wooden cabinetry that has more than enough cupboards and drawers for all kitchen storage needs, as well as looking very elegant. Above it is a matching floating shelf to take advantage of vertical storage in the limited space. The area is further furnished with the basic appliances necessary in the flat. Of course, when family dinners or bigger meals are required, the party can just move to the other building in the living quarters. A small lounge area is decorated with a lovely wood and white Scandinavian sofa and a black armchair. This has a distinct modern character, whilst not taking away from the rustic atmosphere. Closest to our eye is the bed, covered in fine lined and neutral colours, appearing to be optimally comfortable. Right behind the bed we just saw, is a private bathroom sectioned off the a sliding timber door. The bathroom contains a large spa bathtub, toilet and marble floating shelf with a pebble-shaped basin. The simplicity of the area is becoming of the house's general character, and this is accentuated by the semi-plastered walls that are a bit less refined than the rest of the building's interior. 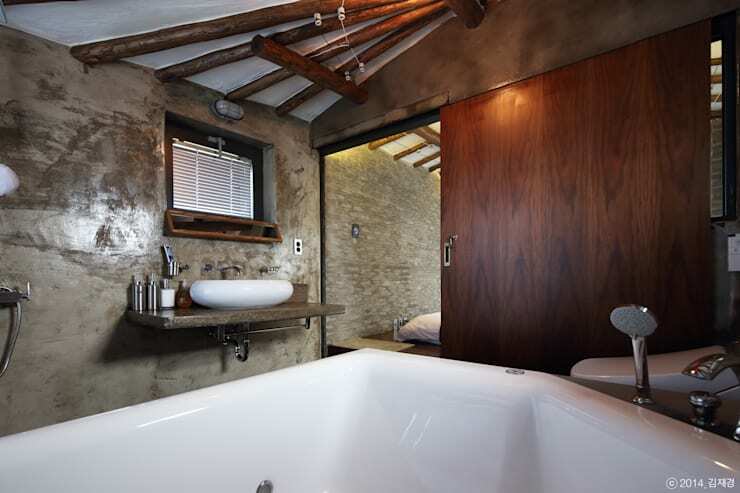 This tranquil and rustic style for bathrooms are popular right now. For more inspiration, check out these: Cool Design Trends For Modern Bathrooms. Now we get to a real treat of the home. As we have seen, the main focus of the house is to harmonise with nature and to allow its inhabitants to live in harmony with nature. Now we can also see that this does not mean that any comfort of luxury should be sacrificed for this pursuit either. Outside the individual flat and bedroom, we find a small, enclosed courtyard surrounded by the raw stones and creeping plants, blending into the surroundings. 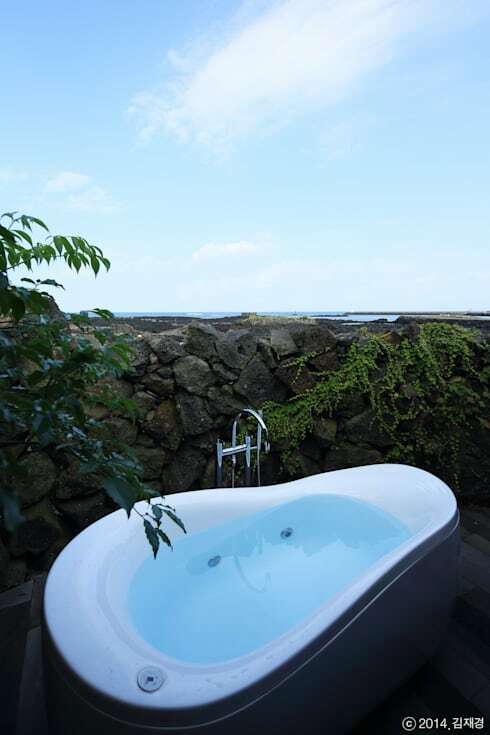 In this courtyard, however, we also find a luxurious free-standing bathtub in which the inhabitants can enjoy their natural surroundings in comfort. Who wouldn't love to have this feature in their living space? What did you think of the Blind Whale House? Love it...or perhaps not your style? We'd love to hear your opinions!